Merkel Opens the Gates - Thoughts From The Frontline - Investment Strategies, Analysis & Intelligence for Seasoned Investors. Perhaps I should issue a storm warning for this letter. Maybe it’s because I had major gum surgery on my entire lower jaw this week and am in a bit of discomfort, but as I read the news coming through my inbox, it’s not helping my mood. This week’s letter will focus on the immigration crisis in Europe – after I muse on what I think is the very disturbing aftermath of this week’s Federal Reserve meeting. It wasn’t a shock that the Federal Reserve did not raise rates. Even the most inside of insiders said the odds were at most 50-50. Those Wall Street Journal reporters who have an “inside ear” at the Federal Reserve all indicated there would be no rate increase. The IMF and the World Bank were pounding the table, declaring that it was inappropriate to raise rates now, and although most FOMC members give lip service to the fact that Federal Reserve policy is to be based solely on domestic considerations, global concerns may well have played a role in their decision. What surprised me was the aggressively dovish stance taken by Yellen in her press conference and in the press release. It would have been one thing to come out and say, “We’re not going to raise rates at this meeting, but conditions are getting better, so get ready,” so that the market could have a little certainty. The statement we got instead, combined with early data from the quarter, is making me rethink my entire view on the timing of an interest rate increase. The Fed punted AGAIN and thus are inviting us to the daily obsession of when they eventually will hike for another 6 weeks. While the economic commentary on the US was not much different than the last statement, they added “recent global economic and financial developments may restrain economic activity somewhat and are likely to put further downward pressure on inflation in the near term.” They see the risks to the outlook for economic activity and the labor market as nearly balanced but [are] “monitoring developments abroad.” Jeff Lacker is the only one that stood out from the crowd with a dissent and the desire to raise 25 bps. Bottom line, the problem now is not when the Fed will raise rates or not, it is the paralyzing discussion about when they will eventually raise rates. We get to do this all over again as the Committee continues to day trade every data point not only in the US but now globally. They are the center of uncertainty and the multitude of excuses over the past few years has reached a tipping point that I don’t believe the stock market will continue to embrace. China has been slowing for 5 years and commodity prices have been falling for 4 years, and the Fed has now discovered them as risks to their outlook. Are we going to now price in the greater chance of a rate hike if China’s PMIs start to improve, if retail sales tail higher? The Fed is implicitly acknowledging again that their policy action over the past 5 years of putting the US economy on a sustainable growth path has been a failure and now if their international concerns become more pronounced, they will also admit to the world that they have no tools to deal with it. I think today’s decision was a bad one. The dollar rally should be over and I’m bullish on precious metals (again) as I don’t understand at all what the bear case is in it anymore. Other commodities should benefit too from the weak dollar.… Therefore be cautious, the Fed did more damage to its credibility today. Lastly and sorry to speak from my soap box to those who don’t care to hear it but, I’m sorry to the retirees that have saved their whole lives. I’m sorry to the generation of young people that don’t know what the benefits of saving [are]. I’m sorry to the free markets that best allocate capital. I’m sorry to pension funds that can’t grow assets to match their liabilities. I’m sorry to the successful companies that are competing against those that are only still alive because of cheap credit. I’m sorry to the US banking system, [which] has been hoping for higher interest rates for years. I’m sorry to those industries that have seen a pile of capital (aka, energy sector) enter their industry and have been or will see the consequences of too much capacity. I’m sorry to investors who continue to be bullied into making decisions they wouldn’t have made otherwise. I’m sorry for the bubbles that continue to be blown. Again, I’m sorry to those who don’t want to hear this. Granted, the global economy is slowing down. But Stan Fischer (Fed vice-chairman) gave an extremely strong speech not all that long ago, saying that the US Federal Reserve was focused only on domestic concerns. We just printed what might be the highest GDP number for the second quarter that we are likely to get for some time. Nobody is happy with the way the unemployment number is working out, but 5.1% and falling isn’t shabby. This is a slow-growth recovery that probably typifies the New Normal, so to expect to find an economy hitting on all cylinders before you normalize rates is not realistic. This Fed, massively dominated by academic Keynesians, has demonstrated that the conditions for normalizing rates are far more stringent than many of us had been led to believe from the speeches of the FOMC members themselves. This is a Federal Reserve with hundreds of staff economists who create numerous models to guide their actions. The fact that none of these models have been anywhere close to right for decades should give us pause. Indeed, in her press interview Yellen admitted that the models don’t appear to be working. We have a Federal Reserve that doesn’t trust its models and is running US monetary policy on its understanding of a flawed academic theory. We’ve discussed in this space why these models don’t work; it’s because they’re based on a theory of economic organization that is fundamentally flawed and doesn’t reflect the complexity of the billions of economic reactions by participants in the marketplace every day. The only way the Fed can build a model to describe such complexity is to assume away the real world – to impute market motives and relationships based on their imperfect, academic understanding of how the world works. Where are we? It is likely that before the December meeting we are going to see third-quarter GDP come in markedly lower than second-quarter GDP. If we are now focused on the global economy, as the press release suggested, that is also likely to be weaker. Inflation, at least the way the Fed measures it, is unlikely to be an issue. In this environment, will they raise rates? I now find that doubtful unless we get some remarkably boffo data points – which would be a surprise. Going into 2016, a presidential election year, unless the US and global economies surprise to the upside, do we think we will see rate increases? It is now quite possible, it seems to me, that the next significant move by the Federal Reserve will be to initiate QE4 when the economy once again weakens or dips into recession. Remember, there is always another recession. The business cycle has not been repealed by leaving rates at the zero bound! Yes, I know that the Fed’s own research shows that QE was ineffective, but that will be one of only two weapons they still have in their arsenal. The other is negative rates, and I doubt they will start out with negative rates unless we get more than a garden-variety recession. As Peter noted above in his final paragraph, the Federal Reserve has changed the fundamental equations of how investors, savers, and businessmen interact with each other. The Fed is distorting the essentials of the market. It is one thing to acknowledge that rates are likely to remain lower because we are in a disinflationary/deflationary world and will be for some time; it is another thing altogether to leave rates at the zero bound. One can make the case for lower rates and QE at the beginning of the Great Recession, but we have now created an environment where market participants may need to assume that rates could be at the zero bound for much longer than any of us ever dreamed. The longer the Fed postpones normalization, the more difficult the return to normal markets is going to be. As an aside, I still think the Japanese yen is going to get weaker against the dollar long-term. My personal trade was done with a 10-year option; but I have to tell you that if I was sitting in front of a dozen screens on a trading desk today, I would be covering all of my long dollar bets and dipping my toes into some short dollar trades. Thank the gods, I am not a trader, because that would be a hard trade for me to put on. This is not simply about migrants. It is one more thing that shows Europe does not work and cannot make decisions.… What we are seeing before our eyes is the collapse of the European project. There is nothing meaningful when we say “EU.” It was an institution that functioned for a while, but countries are no longer paying any attention to Brussels. Once again we are seeing divisions at the heart of Europe based upon economic and demographic realities. As I wrote in my book Endgame, the productivity and wage differentials between Germany and the European periphery have created massive trade imbalances. Normally these are solved through adjustments in the currencies of the countries involved, but the Eurozone locked in such imbalances, leaving as the only solution a deflationary collapse in wages. This has of course also drastically increased unemployment in the peripheral nations. Those problems, coupled with the massive debt run-up in the peripheral countries, has opened up a yawning divide in Europe. Greece is only the first country to totter at the edge of the abyss. And yet Germany remains a profound believer in maintaining austerity until true reforms have been implemented. No debt relief without reforms is their mantra. For Europe, the Grexit and refugee issues are two manifestations of an underlying and much more problematic challenge. The continent’s various unification measures are in danger of coming unraveled. Avoiding Grexit was relatively easy. Yes, the fights were ugly, but it was a simple matter to sweep everything back under the rug. Sweeping a few million immigrants (you don’t think they’ll stop coming, do you?) under the rug is a much greater challenge. How Europe handles the refugee crisis is potentially far more important than the Grexit issue. Some bad decisions could lead to serious problems in not too many years. This is a major development. And the immigration crisis highlights another deep divide. German Chancellor Angela Merkel says the country will accept 800,000 refugees this year. Even considering Germany’s size, that is a very generous number that has earned Merkel praise from humanitarians everywhere. At the same time, European Commission president Jean-Claude Juncker wants to impose quotas for refugees and immigrants upon the entire European Union. He has come up with the idea of “shared responsibility” to push this new doctrine. This is all well and good for nations like Germany that need immigrants, but much of Europe is really not in need of new workers, given their present severe unemployment problems. Not to mention that in those countries budgets are already strained and taking on the task of housing tens of thousands of immigrants and refugees is not cheap. Some of Germany’s neighbors are not pleased. In particular, the formerly communist Eastern European states resent the German-led efforts to impose on every EU nation a quota of refugees it must accept. This is where we start to see parallels with the Grexit crisis. Recall how EU leaders in Brussels tried to steamroll their way over all opposition. They’re doing it again. Consider this little note from last week’s Charlemagne column in The Economist. Policymakers are fizzing with ideas, from the use of development aid to bring recalcitrant transit countries into line to the strengthening of a Europe-wide border guard. Once the principle of shared responsibility for migrants is established, says another official, the numbers of relocated migrants can be scaled up, and new programmes established, without too much wrangling. Ambrose Evans-Pritchard launched into an epic rant on EU arrogance last week. I recommend you read the entire post, but here is a taste. Personally, I think Europe's nations should open their doors to those fleeing war and persecution, with proper screening, in accordance with international treaties on refugees, and in keeping with moral tradition. Those countries that etched the lines of Sykes-Picot on the map of the Middle East in 1916 as the Ottoman Empire was crumbling, or those that uncorked chaos by toppling nasty but stable regimes in Iraq and Libya, have a special duty of care. But the point is where the final authority lies. By invoking EU law to impose quotas under pain of sanctions, Brussels has unwisely brought home the reality that states have given up sovereignty over their borders, police and judicial systems, just as they gave up economic sovereignty by joining the euro. This comes as a rude shock, creating a new East-West rift within European affairs to match the North-South battles over EMU. With certain nuances, the peoples of Hungary, Slovakia, the Czech Republic, Poland and the Baltic states do not accept the legitimacy of the demands being made upon them. But it is the countries of Eastern Europe that are bearing the brunt of the immigration crisis. This map from the New York Times depicts the general flow of immigrants from Turkey into Germany. It was not all that long ago that one could pass freely from one country in the EU to another, but now border walls and controls are being erected. And while Merkel says Germany can take 800,000 immigrants, notice that they are instituting border controls to stem the flow. It’s is all well and good to say you can absorb nearly a million immigrants, but where you going to put them? How will you feed them or school them? That effort takes planning and time, planning and time that have not been much in evidence the past few years in Europe. Just as the Grexit crisis showed us the underbelly of European monetary integration, the refugee crisis highlights the huge difficulty of political integration. Hungarians, Slovaks, and Czechs do not want Brussels telling them how many Syrians they must admit and support. I don’t blame them. Ambrose astutely points out that Europe must now deal with an east-west split on immigration along with the still-unbridged north-south economic chasm. Yet EU leaders push blithely on, thinking they can roll right over their opposition. To them each crisis presents another opportunity to impose structure and an artificial unity from the top down. This is maddening, and it leaves an interesting question unanswered. Why is Germany so willing to accept so many migrants, while other countries are not? Aside from the 800,000 it will take this year, officials have said Germany can handle 500,000 more per year, indefinitely. That starts to add up in a few years, even in a country of 80+ million. This is more than a gesture. What is Merkel thinking? Merkel’s immigration plan presents huge problems, given Germany’s generous retirement benefits and social programs. For every baby boomer that stops working, the country needs at least one person to start working. The US is in better shape only because we have enough legal immigrants to keep the demographic pipeline flowing. Even so, we will hit the wall at some point unless more and more potential retirees keep working. Germany is in much deeper trouble on this point, and Merkel knows it. I suspect she wants to bring in quite a few million immigrants, somehow make good Germans out of them, and keep the economy humming. But there is a very real demographic reason why Germany is so willing to take a surfeit of these refugees: German’s demographics demand it. Simply put, Germany’s population… and especially its indigenous… population is imploding swiftly and certainly. Already there are very real shortages of young, skilled workers, and many German companies openly and regularly complain that they cannot hire enough workers to fill job vacancies because there are not enough workers available for those jobs. Further, Germany needs younger workers to fill those jobs because it needs their salaries for the social welfare programs that Germany is so renowned for. Simply put, there are not enough workers paying into the social programs to pay for them at present, and this problem shall become worse, not better, unless Germany’s population swells measurably in the coming years and decades. So, Ms. Merkel has a clear ulterior motive for her seeming generosity: she wants the present welfare system in Germany that benefits now and will even more greatly benefit more in the future her normal constituency. If Germans are going to retire they shall need either newly born Germans to take their place and pay into the social security systems or Germany shall need to “import” foreign workers. For now, it is the latter that Ms. Merkel is embracing. Before going any further, let’s define some terms. Refugees are persons driven from their homes by war, natural disasters, or other circumstances beyond their control. They have little or no choice but to seek refuge elsewhere. Migrants, in contrast, are people who have homes but choose to move elsewhere, typically for economic reasons. They think they can increase their income or improve their lives in a new country. This distinction is important in international law. Various treaties and agreements obligate governments to give refugees at least temporary shelter. Migrants, because they have a home to which they could return, receive lower priority. One of the problems is that Europe’s incoming masses include both refugees and migrants. Sorting them out is not always easy. Many lack passports and other identifying documents. I saw a small note in the Wall Street Journal this week saying that Sweden is paying a language-analysis firm to verify refugee candidates’ origins by their accents. As good a method as any, I suppose. I think everyone agrees that sheltering genuine refugees is simply the right thing to do. We all know that in other circumstances we could be the homeless ones. Some older Europeans saw World War II uproot millions. Their children and grandchildren have heard the stories, and that awareness probably drives some of the sympathy we see now. While the goals are laudable, there are limits. Even a continent as large as Europe needs to manage population inflows and screen out undesirables. The sheer scale of the challenge is mindboggling. More than four million people have left Syria alone. Tens of thousands more are leaving each week. Most are still in the bordering states of Turkey and Jordan, which have their own challenges and can’t offer permanent resettlement. This graphic from Stratfor shows where people are leaving and where they want to go. You can see that part of the problem is intra-European. People from Kosovo, Montenegro, and Albania want to leave their countries. While some of them might be able to legitimately claim refugee status, I think most can be properly labeled as economic immigrants. 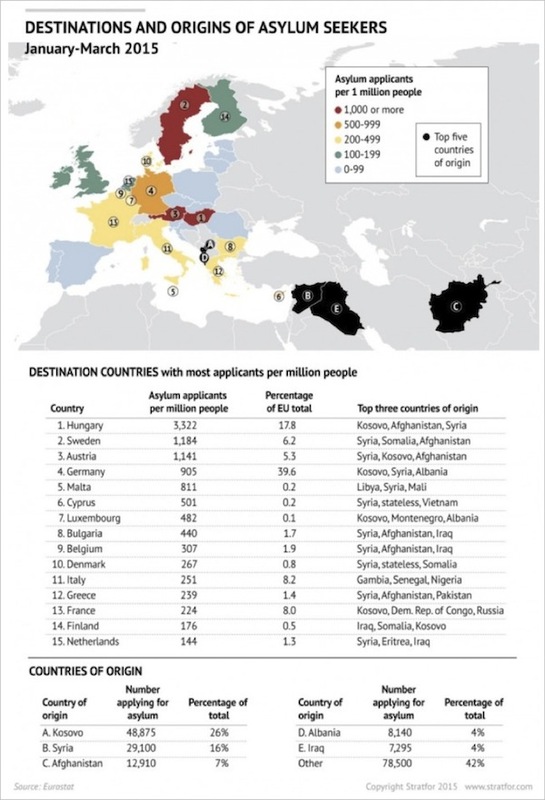 It’s also interesting which countries have received the most asylum applicants relative to their populations: Hungary, Sweden, Austria, Germany, and tiny Malta lead the list. In sheer numbers, though, Germany is clearly the favorite destination. Merkel has a great idea – with a potentially fatal flaw. Germany, like much of Europe, doesn’t have a great history of assimilating immigrants, even those from relatively similar cultures. I’m sure the majority of immigrants are ordinary people who will be glad to have homes again and act accordingly. Within their numbers, however, will likely be some who don’t appreciate German culture, including a small number of radical Islamists. As of now, Germany is about 4% Muslim. That number is growing, but gradually. Adding several million more to the population in a few short years will dramatically increase the Muslim population. 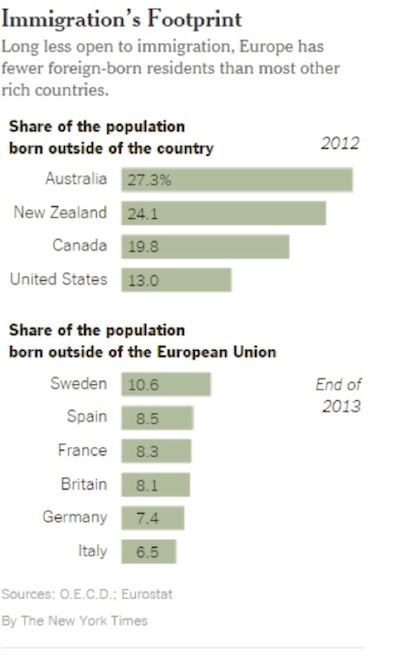 Interestingly, Europe has fewer foreign-born residents than most other wealthy regions of the world. The rise of anti-immigration political parties throughout Europe is now quite evident. Such parties are not yet a majority anywhere, but Marine Le Pen in France is only a crisis or two away from winning a national election. And the proliferation of stories that keep coming out about problems with immigrants doesn’t help the matter. For example, consider this Telegraph story of a recent incident in France. Some young French women disrupted an Islamic event (a lecture by two Islamic religious leaders seriously discussing whether wives should be beaten – dear gods) by rushing onto the stage and inappropriately stripping to the waist and shouting feminist slogans. The Muslim men in the crowd were not amused, to put it mildly. The pictures of them manhandling the women and angrily kicking them while they were on the floor are disturbing. Europe will see more such clashes if millions of new refugees decide to stay there. Can Germany handle them? I don’t know, but Syrian culture and German culture have little in common. It will take time for both sides to learn the other’s ways and even more time to respect them. The interviews I’ve seen with Syrian immigrants show them generally to be relatively educated, potentially hardworking, and adventurous, just wanting to find a place to work and live their own lives away from the violence. Typically, that is what you want in your country. But keeping the flow of immigrants to a reasonable level does not seem to be in the cards for Europe. However obvious this may be to say, there is no logical end to this process, even if the Syrian crisis ended tomorrow. As it becomes known that Germany is so open to migrants, that fact offers an irresistible invitation to anyone living in a country roiled by violence or economic crisis, which basically means most lands from Libya to Pakistan. There is no terminal point at which the nations sending migrants would ever run out of candidates seeking refuge and asylum. And even that projection takes no account of the likely spread of open warfare and terrorism into Turkey and Egypt in the coming decade. So let’s put those numbers in context. Germany’s population is about a quarter that of the United States, so multiply all those refugee figures by four. Imagine if a U.S. president declared that the country would commit itself to taking between two and four million new refugees and migrants, annually, over the coming years—and that over and above other forms of immigration. Even given the diversity of the U.S. population, that would represent an inconceivably large social transformation. If assimilation does not go well, Germany could find itself in cultural chaos as the immigrant minority tries to find its place. Government spending will go up as politicians try to keep everyone calm, which will drive up taxes and create more resentment. If assimilation does go well, the new generation of workers will restore Germany’s fiscal balance and enhance its export-driven economy. What’s not to like? Well, in this scenario the gap between Germany’s economic strength and that of the rest of the continent will grow even wider. The euro will make even less sense than it does now, and people outside Germany will see no advantage to staying under the same roof. Both scenarios are bad. The second one may be less bad but will come at a cost: the collapse of European unity. Keep in mind that this demographic and social adjustment will be playing out on a continent that has just forced its eastern half to accept immigrants it did not want and whose southern tier is still trying to emerge from a deep, prolonged economic slump. Greece stayed in the club this time because it had little choice. That won’t always be the case. As more and more countries, especially the larger ones, see themselves losing their sovereignty to Brussels and to an increasingly out-of-touch elitist leadership, the pressures on the European Union are going to become ever more profound. It would be a great irony if, after all, it wasn’t the irrationality of the single currency that was the final straw to break the back of the European Union. My September travel schedule still looks surprisingly light, but that is going to change in October or November. Right now there is nothing until the end of the month, when I will go to Detroit for a day and then on to Toronto for a few days. In Toronto I will be speaking at the annual CFA Forecast Dinner. I am told there will be some 1200 people there. I will also be doing a completely different presentation the night before for my Canadian partners, Nicola Wealth Management. You can contact them for info at 604-739-6450. At some point I have to get to New York but haven’t been able to work out the schedule yet – it appears likely it will be the first week in October. On November 6-8 I will be speaking at the Financial Festival, which is hosted by investment impresario Todd Harrison. There is a very lively lineup of speakers, and in addition to my normal presentation I will have a debate with my old friend, the quick-witted and sagacious Jeff Saut of Raymond James. I can’t beat him with one-liners – he’s the king there – so I will simply have to make do with facts and reason. He has been wearing his bull-market cheerleader uniform of late. Oddly, it looks good on him. Just saying… If you want to know more about the event, just click on this link. I will be speaking in the Oregon wine country in the middle of October. The plan is to visit San Francisco first with my biotech buddy Patrick Cox to see a few companies and to do a deep dive on where we are in the antiaging movement at the Buck Institute, the world’s premier antiaging research center. Pat has been invited to meet with several of the leaders, and I get to tag along as sidekick. I also see Atlanta and Hong Kong showing up in the calendar. Maybe even a side trip to Jersey Shores when I’m in New York. George and Meredith Friedman are dropping by Monday night for dinner, and the next day my business partners Olivier Garret and Ed D’Agostino will be in town to go over planning for next year Strategic Investment Conference, which will be held here in Dallas, May 24 through the 27th. Save the date in your calendar, because it’s going to be the best ever. We are going to open up the conference to a few select sponsors; so if you would like to participate, drop me a note. I spent a great deal of time planning the speaking lineup and overall ambience of the Strategic Investment Conference. Fortunately, I have a fabulous team that can help me with the actual details. One of the cool things we will have this next year is a networking app that will actually let conference attendees (who opt in) know who is there, what they do, and what they are looking for. It is actually a very sophisticated way for you to know who your fellow attendees are and to meet the one person you know is there but just can’t find. I think that will increase the value of the conference immensely. Our latest Mauldin Economics documentary film, China On The Edge, premieres online this Wednesday, September 23. As you know, China’s fate is in many ways going to be the whole world’s fate. We pulled in some of our top China hands to show you what already happened and what will be next. Our video team did an amazing job. The production is simply top-notch, network-TV quality. I’m very proud of this work, as you can probably tell, so let me just ask your help. We want to show China On The Edge as widely as we possibly can. Click here and enter your e-mail to receive a link so that you can watch the premiere absolutely free. If you find the film valuable, please share it with three other people. I really want to get this film in front of a whole new audience. With your help, I know we can do it. Your friends will thank you and I will, too. OK, it’s time to hit the send button, take a little time off, and then get back to the work stacking up in my inbox. Have a great week.